Jason Pearce scored on his Wigan debut to earn his side victory at Reading, a first win since December. The central defender turned home from close range after Adam Federici fumbled Leon Clarke's header. Wigan keeper Ali Al Habsi made first-half saves from Garath McCleary and Nathaniel Chalobah before Hal Robson-Kanu headed wide after the interval. Alex Pearce hacked off the line for the home side late on as Wigan held out and they are now six points from safety. The Latics are still second from bottom but manager Malky Mackay will welcome just his second league win in 14 attempts since taking charge in November. His side had won just once in 17 games in all competitions before kick off and looked in danger of being cut adrift at the bottom of the table along with Blackpool, who are 10 points behind 21st-placed Brighton. 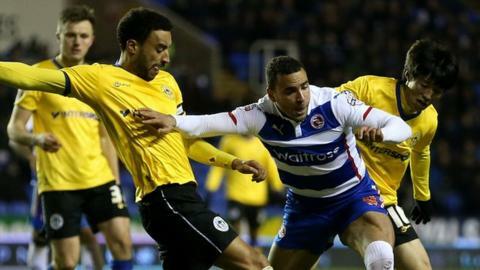 For Reading, defeat will come as a reality check after their win over Derby County on Saturday, which set up an FA Cup quarter-final meeting with Bradford. Steve Clarke's side started well at the Madejski Stadium and Pearce had a header scrambled off the line by Wigan's Mark Antoine-Fortune. But Federici dawdled on a backpass and was forced to concede a corner, which led to his poor punch and Pearce's straight-forward finish. Pearce joined from Leeds in January as Mackay continued to overhaul the squad he inherited from Uwe Rosler but it was the long-serving Al Habsi who provided resistance as Reading pushed. Al Habsi stood in the way of McCleary and Chalobah before making an excellent stop when Oliver Norwood smashed a free-kick from range. Wigan sat deep to defend their lead but threatened again late on and when James McClean's cross was almost turned into his own net by Jordan Obita but Reading centre-back Pearce intervened to prevent a second. Reading manager Steve Clarke: "That was rubbish. I've no idea why so it's something I've got to look long and hard at. "I need to find a different way to play at home. Maybe I need to change the team a bit. Our home performances and our away performances just don't relate to each other. "It's very frustrating and I've got to be honest that tonight was a little bit embarrassing." Wigan Athletic manager Malky Mackay: "It was a thoroughly deserved win against a very good team. To win and to win the way we did, I was really delighted. "It's a brand new group I've got now. Twelve players have left and eight have come in in the last three weeks. "I'm now looking at some real warriors there now. The gap has closed and there's still a lot of points to play for. That group of players certainly don't look as though they're down and out." Match ends, Reading 0, Wigan Athletic 1. Second Half ends, Reading 0, Wigan Athletic 1. Attempt missed. Billy McKay (Wigan Athletic) right footed shot from outside the box is close, but misses the top right corner. Assisted by Ali Al Habsi. Attempt saved. Stephen Kelly (Reading) right footed shot from the centre of the box is saved in the bottom left corner. Assisted by Pavel Pogrebnyak with a headed pass. Corner, Reading. Conceded by Kim Bo-Kyung. Jordan Obita (Reading) wins a free kick in the attacking half. Alex Pearce (Reading) wins a free kick in the defensive half. Attempt missed. Billy McKay (Wigan Athletic) right footed shot from the right side of the box is just a bit too high. Alex Pearce (Reading) is shown the yellow card for a bad foul. Kim Bo-Kyung (Wigan Athletic) is shown the yellow card. Corner, Wigan Athletic. Conceded by Oliver Norwood. Corner, Wigan Athletic. Conceded by Stephen Kelly. Attempt blocked. Leon Clarke (Wigan Athletic) left footed shot from the centre of the box is blocked. Assisted by Martyn Waghorn with a cross. Corner, Wigan Athletic. Conceded by Jordan Obita. Attempt missed. Stephen Kelly (Reading) header from the centre of the box misses to the left. Assisted by Garath McCleary with a cross. Hand ball by Leon Clarke (Wigan Athletic). Andrew Taylor (Wigan Athletic) is shown the yellow card for a bad foul. Billy McKay (Wigan Athletic) wins a free kick in the attacking half. Substitution, Reading. Hope Akpan replaces Daniel Williams. Nathaniel Chalobah (Reading) wins a free kick in the defensive half. Attempt blocked. Martyn Waghorn (Wigan Athletic) left footed shot from outside the box is blocked. Assisted by Kim Bo-Kyung.